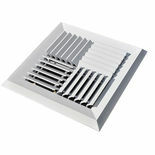 Save on the best adjustable vent covers you will find anywhere online, right here at PlumbersStock.com. No matter what you need, we have it in a variety of colors and configurations. We have the best solutions for improving your home heating and cooling. Air diffusers are delivery points for conditioned air, typically installed in ceilings. The main thing to remember with diffusers is that unlike registers, you cannot open and close them. Diffusers are always open. AC floor registers differ from diffusers in that they can be opened or closed. We have registers for floor installation, as well as wall and ceiling. Air conditioning grilles, as the name suggests, is the vent cover where air is sucked back into the system. Air louvers admit light and air, but they shut out rain and direct light. You typically see them installed in the walls of an attic. A grille is an opening of several slits side by side in a wall or metal sheet or other barrier, usually to let air or water enter and/or leave but keep larger objects out like a filter. More commonly, grilles are used as return or exhaust air inlets. Our vent covers include return air grilles, baseboard return air, toe space, linear, floor, and filter. 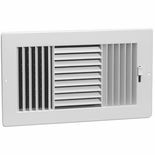 Return Air Grilles - Standard features include ½ inch spacing dual angular louvers, 22 and 20 gauge cold roll steel. These grilles can be installed with louvers in up or down position for vision-proof effect. The standard color is white. 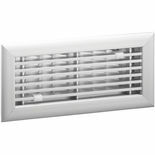 Baseboard Return Air Grilles - Standard features include ½ inch spaced vision-proof dual angular louvers for strength and maximum free area. Margin edges are 7/8 inch projection for baseboard installation. Toe Space Grilles - Ideal for return air in the toe space areas between kitchen cabinets, stair risers, built-in vanities, etc. Floor Grilles - Steel honeycomb construction that is usually brown in color. Filter Grilles - Filter grills can hold from 1 to 4 inches thick standard filter sizes. A register is an air vent cover attached to an air-distributing duct for the purpose of controlling the discharge of air into the space to be heated, cooled, or ventilated. Floor Registers - Steel honeycomb construction available in brown. Baseboard Registers - Steel construction, fan shaped with ½ inch spaced louvers. Residential Diffusers - An air distribution outlet, usually located in the ceiling and consisting of deflecting vanes discharging supply air in various directions and planes, and arranged to promote mixing of the supplied air with the air already in the room. Linear Grilles and Diffusers - Used for sidewall, ceiling or sill application. Standard features include all extruded aluminum construction with core blades that run parallel to longest dimension. These units are reinforced with pressure lock honeycomb construction to withstand heavy foot traffic, available in 1/3 inch(pencil-proof) and 0.5 inch spacing, 0 or 20-degree deflection on both spacing options and available in lengths of 144 inches in one piece with a Satin Anodized Finish. Floor Grilles and Diffusers - used beneath a raised floor to provide conditioned air directly to the occupied area. Ceiling/Sidewall Diffusers - Used for ceiling or sidewall applications and available in 3-way, 2-way, 3 or 4-way and adjustable. Standard features include all component parts, rivets, linkage, and handle enclosed in valve to assure trouble-free operation. These units are available in soft white. 2-Way Diffusers - ½ inch fan-shaped louvers for heating or cooling. 3-Way - fan-shaped louvers for draft-free heating or cooling. 3 or 4-Way Adjustable - Adjustable steel blades with steel multi-shutter damper. Blades are fully adjustable for 3 or 4-way air flow pattern. Air deflectors are vertical and horizontal with nylon bushings for easy adjustment and quiet settings. Adjustable Diffuser - Adjustable steel blades with steel multi-shutter damper. Vertical air deflectors with nylon bushings for easy adjustment and quiet settings. Ceiling Diffusers - There are several different types of ceiling diffusers available in soft white. Step Down Ceiling Diffuser - Step-down core design allowing for uniform air distribution with 4-way air diffusion. Square Ceiling Directional - Five different air patterns. Step-Down Round Diffuser - Ideal for residential and light commercial application. Attractive concentric ring deflects air stream 360 degrees. Ceiling Curved Blade - Provides uniform air distribution across ceiling or sidewall with eight air patterns. Adjustable Curved Blade Diffuser - Individually adjustable steel curved blades with lever operated steel multi-shutter damper. Multi-Direction Ceiling - Designed for large volume air delivery for evaporative coolers or central blower systems. High-Velocity Multi-Louver Flush Diffuser - For evaporative cooling or high-velocity exhaust applications with divided 2-way multi-louver and combination shut-off. Single Deflection Aluminum - For evaporative cooling or high-velocity exhaust applications with adjustable airfoil blades. We have got all the adjustable vent covers you could possibly need. Whether you need a Shoemaker diffuser or a Hart & Cooley grille, PlumbersStock has a great deal in store for you. If you have trouble locating the right part please contact our team and a knowledgeable and friendly member of our staff will help you with your purchase, project, or whatever else you may need.